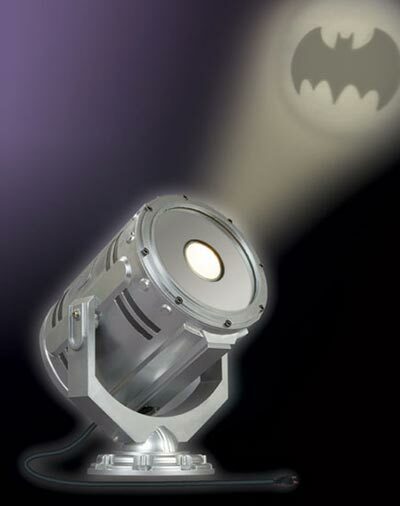 With the flick of a switch, this metal-encased device projects a light-up Bat-Signal an impressive 16 feet! Powered by a plug-in, UL adapter and two ultra-bright bulbs, the piece also includes a fan to keep it cool. With a swivel feature enabling the Bat-Signal to pan across the room, Batman is sure to come to the rescue no matter where he is when hes beckoned. This fun gadget measures 12 inches tall by 2.25 inches wide by 9 inches deep and will project a bat signal onto your wall of 16 feet. The Desktop Bat signal is available to buy online for $309.99 from the BigBadToyStore.